I cut the top 3/4″ wider and 1″ deeper than the box. In order for the hinges to work correctly they need to be offset a little bit. 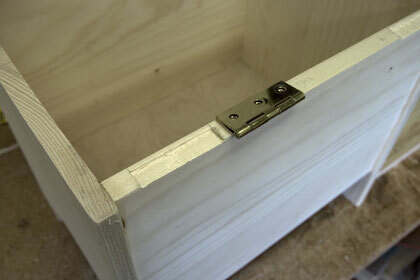 The following photos show how I did the hinges. Layout the locations for the hinges. A handy little tool I have is the Incra Precision T-Rules. You just put your pencil tip into the correct hole and drag it along the edge. They are very accurate and really speeds things up. 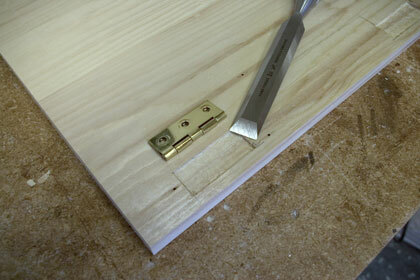 Another little trick I use with brass hinges is to use a small steel screw to start in each of the holes. 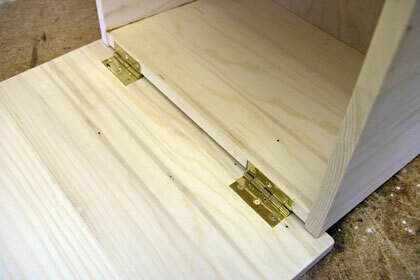 Then us the brass screws to install the hinge. This reduces the opportunity to deform the head of the screw and burr the edges.Sand everything smooth and apply what ever stain you like. I really like the General Finishes EF line of stain and finishes. The EF stands for environmentally friendly and the water clean up really makes it nice. That’s about it. We hope you liked this project. If you build it and your friends ask where you got such a clever idea, please tell them that you got it at RunnerDuck.com. Depending on the number of clamps you have the first step of this project can take a while. There is a lot of gluing and clamping to get all the panels ready to cut and assemble. It start out my cutting the pieces to length plus about 3″, that gives me room for the snipe from my planer when I run them through. I’m really big on machine tools and use my planer to even out the boards after they are glued, but I’m getting ahead of myself. Here are the dimensions of the stool as a guide. 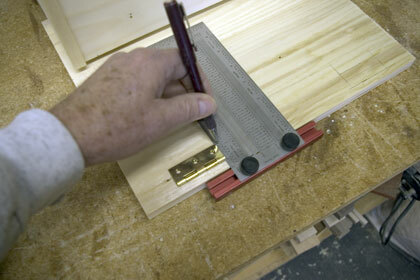 Trim the edges of the boards with a “Glue Line Rip” blade from Freud. I use that because I don’t have a jointer but it works really good. After you’ve cleaned up the edges lay the boards out and match the grain. Make marks, I use chalk, across the edges so that you’ll remember what pieces match up. Using a square make a small line across each edge to show where the biscuit joints will go. I made mine about 3 1/2″ apart. Align they biscuit joiner with the marks and make your cuts. Now glue the panels together with biscuits. I used #10 biscuits. Put glue on one half of the biscuit and insert it into the slot. Apply glue all along the edge. Apply glue to the other half of the wood and apply additional glue to the biscuits. Put the pieces together and clamp them. Not only clamp them from the edges but add a couple of pieces of scrap wood across the top and clamp them to help keep the surface flat during the drying. Once all the pieces are dry we’ll start cutting them to size. I’m sorry that I’ve been a little flaky posting projects but I’ve started a new one that I want to share. It’s a simple little storage stool that I plan to use in my fifth wheel. Space is always at a premium so a little more storage should help. I started off by getting some 6″ spruce to make it from. Tweleve feet should just about do it. Above is a rendering of what it should look like when I’m done. I created the picture with my Rhino CAD software. It does a really good job. I’ve completed this project and it is posted on my Home Decor projects page at http://www.runnerduck.com/home_decor.htm just click on Wine Rack near the bottom of the page and you’ll be taken to the wine rack page. Here is a picture of my finished wine rack. If you had a chance to follow along with this project I hope you enjoyed it. Let me know if you had any issues with the instructions. Here’s the next step in building my wine rack. Sand all the Walnut pieces since it will be really difficult to sand them when the wine rack is put together. Do not sand the inside edges of the vertical supports since they will have to be flush when bonded. I put the vertical supports flush together and sanded the outside and inside edges. After all the Walnut pieces were sanded I stained them with Danish Walnut. Do not get any stain in the groves or on the mating surfaces of the vertical supports. Now we need to start gluing the pieces together. Clamp spacers to the outside of the small shelf pieces to align the Maple pieces. Carefully apply glue to each of the groves. Don’t use too much glue and keep it off of the stained pieces. The glueup should look something like this. If your sawing was very precise then it might take some tapping to persuade the Maple pieces into place. That should do it until next week. Have a great week ahead. Today I made a bunch of sawdust. I got all the pieces cut out and they are now ready to finish and glue. The first thing I did was set up my dado blade for 1/2″. It isn’t actually 1/2″ so I cut a scrap piece and measured it. I like to use callipers to take accurate measurements. Next I took the Maple and ran it through the planer until it got the same thickness as the dado. I used a scrap piece of Walnut that I ran through the dado to make sure that the Maple fit in the groove. I also ran the Walnut through the planer to make sure that each piece was the same 3/4″ thickness. I wanted the Maple supports to be exactly square so I set up my table saw width using the planed Maple boards. Cut the Maple boards to 15 3/4″” long and then cut them into 1/2″ square strips. Cut all the Walnut pieces per the cut list on Step 1. You should now have a pile of pieces that look like this. Using a zero clearance insert in your tablesaw, set up the dado. Using scrap pieces get the depth exactly the thickness of the Maple pieces. Precision is the key to making this project look nice. Set up the tablesaw miter with a stop and dado the shelf pieces. The dado should start 1/2″ in from each end and then one more in the middle. Setting up to cut the vertical pieces is a little tougher. Set the dado to half the height so the two pieces together just fit the Maple pieces. The top and bottom of all the pieces will be dadoed so that the Maple pieces are flush to the top and bottom of the sides. The top middle sheld dados need to be 4 1/4″ down from the top and the bottom middle shelf needs to be 3 15/16″ down from the top of the previous dado. You should now have all the parts cut and ready to assemble. They should look like this. Next weekend we’ll finish and assemble the wine rack. I started by cutting the Vertical Supports. Make each pair out of the same piece so when you glue them together they will match. Another way you could do this project is to mortise the vertical supports for the cross supports and make the vertical supports 1 1/2″ wide instead of 3/4″. I don’t have a motoriser and I’m too lazy to chisel them. I’ll use my tablesaw and a dado. Once you cut the Vertical Supports keep them matched by marking them with a piece of chalk. This will prevent them from getting mixed up later on. This is the current project that I’m working on. The picture above is my design for a Wine Rack. I’m going to make it out of Walnut and Maple. I should get a good start on it this coming weekend. The design was done in Rhinocerous CAD software. I’ve already made a mockup out of plywood and now it’s time to make the real deal. RunnerDuck Eggspress, www.runnerduck.com, is pleased to start a woodworking blog for all the weekend woodworkers that have projects and ideas they would like to share. I expect this to be a two way street with woodworking ideas and suggestions as well as projects that you might like to share with others. Pleas join me in this new forum and lets have some fun.